My shins look like midgets took razors to them, but I cian't blame anyone but myself for the twenty or thirty cuts. The first batch I self-inflicted while gardening. Over the weekend, I built two new garden boxes. Into these I planted onions, five kinds of peppers, and tomatoes. These join the kohlrabi, broccoli, potatoes, garlic, leeks, lettuce, and shallots already growing in the other boxes. Also, bending to the inevitable, I put some flowers, primrose and pansies, into the small box by the sidewalk. I had company while I worked at filling the new boxes with fresh soil. Miss Jane, a doe that first came to visit last year during the fires and drought, apparently has decided to make herself at home in downtown Asotin. She ate the new leaves off the Brady's apple tree a dozen feet away while I put the tomatoes in and I'm pretty sure the look on her face could be interpreted as "Are they ready yet?" Short answer for Miss Jane, "No." Longer answer - I need to build a fence. None of that left me scarred. Dirty, yes, because I derive a great deal of pleasure in working with the soil. The slashes on the shins came from tackling overgrown roses. The roses need to go to make room for other plants. Roses don't like to be messed with. They bit right through the pants I wore, stabbed through gloves, and were generally a pain to remove, but I'm stubborn and don't mind a little bleeding for a good cause. The roses and the baby walnut tree are kaput, ready to go to the recycling facility. So to are the raspberry canes. I thinned those while I was in a blood-letting mood, removing most of the dead canes to give the new ones room to fill the void. Last year, we got quarts and quarts of raspberries, with the grandkids helping harvest. It will be more gentle on little hands with the bed opened up a bit. Meanwhile, I added innumerable tiny scratches to my forearms to the ones on my shins. Then, yesterday, I decided - which might be the wrong word as it implies thought when what I felt was need - to go trail running instead of attending a track meet. Every once in a while, with a force as strong as an addictive compulsion, I have to get onto trails, to feel earth and rock and leaves under foot, the slap of wet brush against my skin as I head into the woods to visit the wild. Yesterday that hit and hard. I had plenty of daylight and good running weather with cool temps, clouds, and a spritz of rain. I drove up to the North Asotin Creek trailhead, changed into run gear, and gave myself permission to play. This early in the season the trails around here tend to be a bit overgrown. Well used ones will naturally define themselves with the increased people traffic clearing the path and edges. I tend to avoid the well-travelled paths, so I get the trail grabbing and stabbing as I pass. Sometimes I abandon the trail for a bushwhack if I see an interesting feature I can't get to otherwise. Invariably, my shins and thighs take a beating though I don't notice until I get back to the parking lot. At least one scratch came after I elevated to avoid stepping on a garter snake. In his defense, he was hustling out of the way, too. A pretty slitherer, the snake fled but not before I dodged into a dead shrub. No harm, no foul. As the Black Knight would say, it's just a flesh wound. The wild turkey pecked around for fodder at the end of the canyon where the basalt formations back off the creek. This is where I've encountered bears and bear cubs, elk, deer and, high on the bluffs, big horn sheep. The turkey ran at speed when I got close. The sun made an unexpected appearance after I hit the turnaround. With no one to laugh except the animals, I ditched the shirt and let the heat baked into my back as I careened my way back. I ended up running much faster than I intended - or than I thought I could. The return trip was nine minutes faster than the outbound leg, nearly two minutes a mile faster. Most of that was in the final two miles. The goal for the day was to stay steady, but the feel of rocky soil interspersed with pine needles and the warmth on my skin lent a sensation of pure pleasure. Since I don't train any more, I surrendered to the trail and let my stride open up. By the time I got back to my car, I had burned that 'need' feeling out, replacing it with peace. I don't get to this point often enough. As Emerson wrote, Live in the sunshine, swim the sea, drink the wild air. I highly recommend it. You don't need to run, either. Walking will do it to. 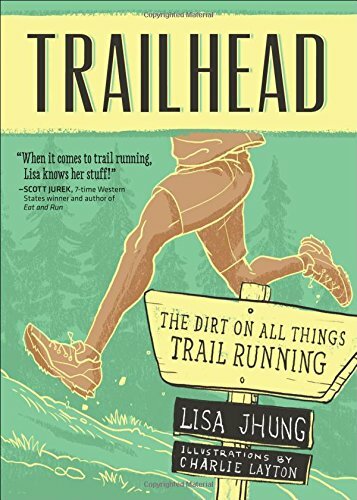 For those looking for a good book to get introduced to trail running, take a look at Lisa Jhung's book TRAILHEAD. Alternately informing and funny, she's written a wonderful book for newbies and gristled veterans alike. Hjung delves into mud and snow and how to make cleats for handling ice, the different types of trails, gear, food, first aid, animal encounters (those two chapters are next to each other), and trail etiquette. It's easily the most comprehensive yet accessible book I've read on trailrunning. Better yet from my perspective, she counts anyone who shuffles faster than a walk along a piece of dirt as part of the club. Worth checking out. 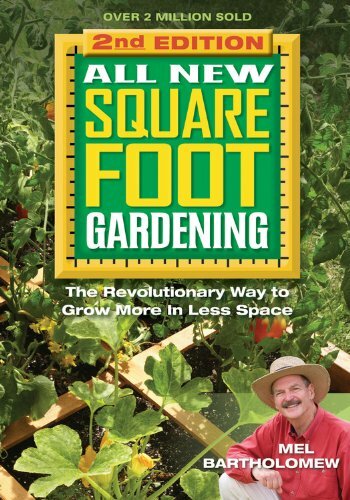 If you're into gardening, my favorite book, written by an aerospace engineer is New Square Foot Gardening by Mel Bartholomew. It's designed for those of us that love fresh produce, enjoy playing in earthy soil, and are inherently lazy. I plant stuff. I don't weed. Then I harvest by the bushel. Unless Miss Jane beats me to it. Need to figure out how to fence the garden without making it look like Stalag Thirteen.